Is your snoring keeping your partner awake all night? Do you wake up feeling tired and exhausted? We all know a good night’s sleep is one of the pillars of good health. And yet, as many as one in five Australians have problems with snoring or sleep patterns. Snoring may seem harmless but it can be a sign of a more serious medical condition. Sleep disordered breathing is a medical term used to describe disrupted breathing occurring multiple times during the night. The resulting poor quality sleep affects our lives with daytime sleepiness, fatigue and irritability. What role do dentists have with snoring? If we suspect you’ve got a problem, we can liaise with your medical doctor and our team of medical specialists to arrange investigation and management. When you lie down and sleep, your airway can become partially blocked due to sagging of the muscles in and around your throat and tongue. When you breathe in, the flaccid tissues blocking the airway around the back of your throat vibrate making the snoring sound. 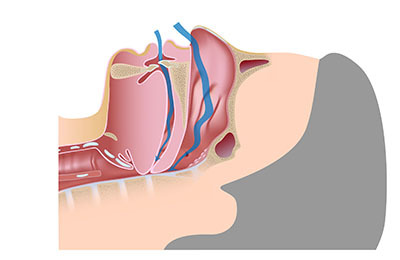 If you have a wide-open airway with no blockage, there is no vibratory sound or snoring. Anti-snoring appliances are designed to help open up the airway and reduce snoring. 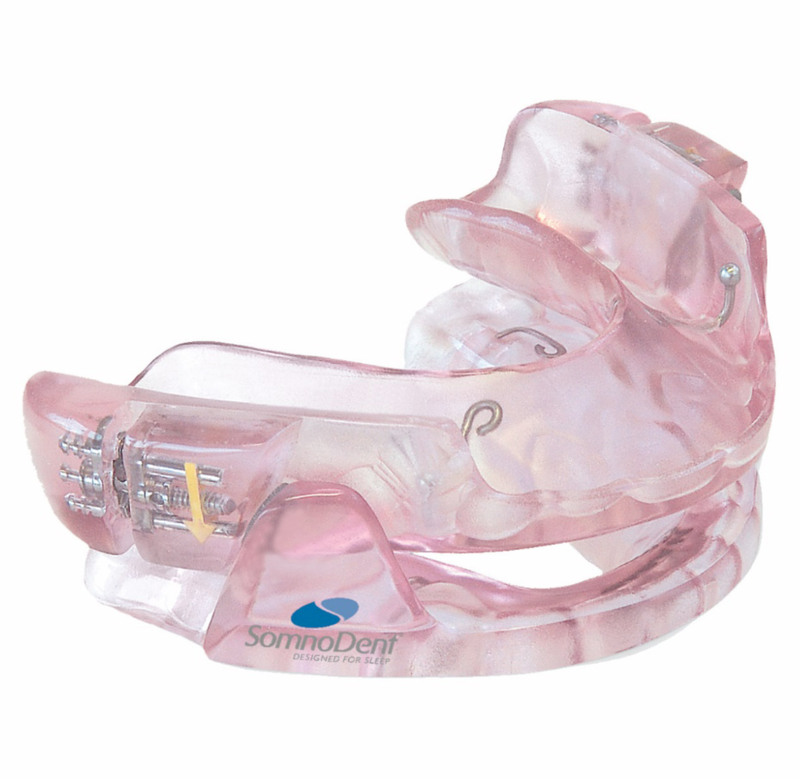 A dentist made Anti Snoring Appliance is commonly termed a Mandibular Advancement Splint (MAS). It is a custom made medical appliance designed to hold your lower jaw (mandible) forward to open up the airway during sleep. 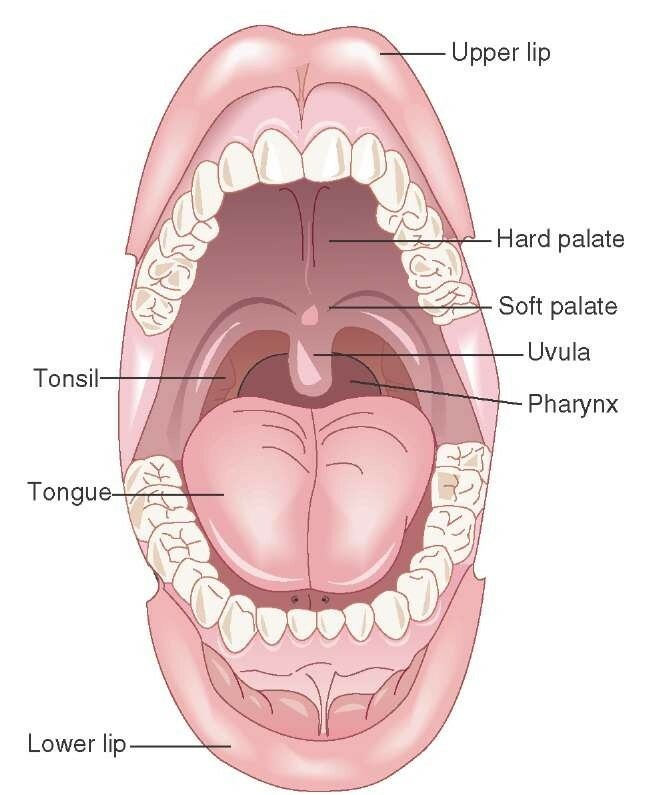 When the lower jaw is forward, the base of your tongue comes off the back of your throat. This allows the muscles of your throat to stretch so your airway doesn’t become blocked. If you are a heavy snorer and often wake up tired and sleepy you may be suffering from obstructive sleep apnoea. Obstructive sleep apnoea is a sleep disorder where your breathing is repetitively interrupted due to the blocked airway depriving your body and brain of oxygen. An apnoea means that you’re holding your breath (as if you were under water) for more than 10 seconds. People with obstructive sleep apnoea have disrupted airflows and unknowingly hold their breath many times during sleep. Many sleep apnoea sufferers are often unaware of their sleeping problem. It’s often their bed partner who notices the snoring, sounds of choking or gasping for air as the sufferer struggles to breathe. Treatment options for Obstructive Sleep Apnoea include weight loss, CPAP (Continuous Positive Airways Pressure), surgery and oral Mandibular Advancement Splints (MAS). The key to treatment success for sleep apnoea is to get a proper diagnosis and a personalised management plan. To understand why your sleep isn’t restful, we can organise a sleep study. A sleep study involves carrying out tests to better understand what is happening when you’re asleep. The test results give us an insight into your sleep and breathing patterns, heart rate and other body functions. Sleep studies are considered the best way to diagnose sleep disorders and are conducted at a sleep laboratory in a hospital setting. We work with a team of Sleep Physicians, Ear Nose and Throat Surgeons and your medical GP to coordinate investigation and management. In serious cases, a CPAP machine may be required during sleep. In most cases, a custom made oral appliance such as MAS also known as an Anti-snoring appliance may be enough to improve your sleep and health. You may like to explore and evaluate various features of your sleep using a free app on your smartphone from GoodSleepToolKit. CPAP is an acronym for Continuous Positive Airways Pressure. The CPAP machine is considered the best treatment option for Obstructive Sleep Apnoea. This sophisticated medical device is a pump that’s designed to blow air under low pressure. The continuous positive airways pressure can hold your airway open while you’re asleep. This enables you to stop snoring, breathe well and sleep soundly. Did you know your enlarged tonsils or large tongue could partially block your airway during sleep causing snoring, heavy breathing or sleep apnoea? If we suspect a need to improve your airway, we may recommend a referral to an Ear, Nose & Throat Surgeon.